Properties in Oberstadtfeld average 4.6 out of 5 stars. 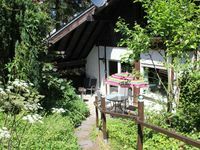 A beautiful holiday home for 9 people, in the heart of the Eifel Volcano area. Property 30: A beautiful holiday home for 9 people, in the heart of the Eifel Volcano area. Attractive accommodation near the centre of the village. Property 37: Attractive accommodation near the centre of the village. Country house on the south slope with a lot of light in the middle of the woods. Property 38: Country house on the south slope with a lot of light in the middle of the woods. Reality was much better than in the picutures, everything in the house looked brand new. The hosts were super friendly and helpful. A surprise was the sauna and pool table we could use. There are lots of things to see and do in the surroundings. Nature is beautiful over there. Recommend it and would want to come back! My husband and I thoroughly enjoyed our stay here! The room was clean and comfortable. We were able to wake up to the sound of horses in the pasture and be within very close driving distance to the Nurburgring. This location is also very convenient for day trips to Bonn and Cologne. The coffee provided was delicious, and we were able to store extra beverages in the refrigerator just outside our room. No complaints! We would highly recommend, in particular if you are coming to explore the Nurburgring.